Today at 1500 GMT marks the start of our Easter Weekend 2017 sale! This 40% off sale includes most of our and third party released products! If you’ve been holding out for a sale on a particular module, now is your chance! This sale will last until 24 April 2017 at 0900 GMT. Although the Normandy map was built to support our growing line of World War II products, there is no reason it cannot also be used for the modern aircraft of DCS World. These two videos show one such example: an Su-25 attack mission. These are un-edited looks at the Normandy map that we believe shows off the outstanding level of detail and the new lighting system. Pre-purchase the Normandy map and save 20%. Over the past few weeks we’ve released images and videos of several allied and axis tanks coming to the World War II Assets Pack. 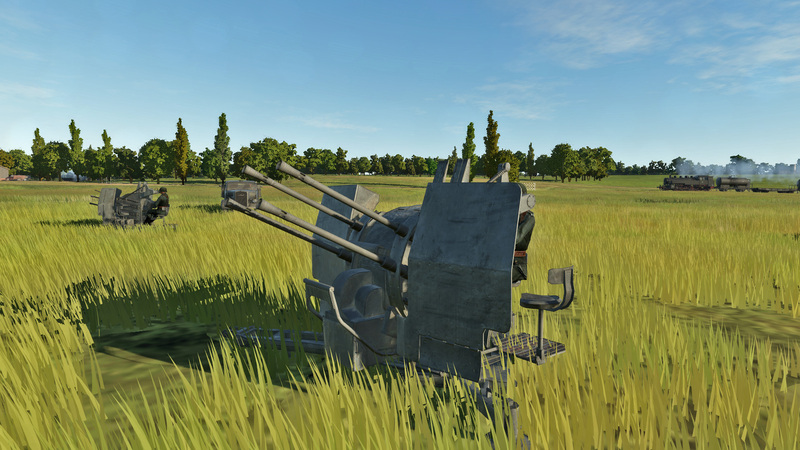 Today, we’d like to share some work-in-progress images of some of the new anti-aircraft units that are also coming to the Assets Pack. In our continuing effort to improve version 2.0.5 of DCS World, we are releasing Update 4 this weekend. Please find the complete changelog here. Since the Open Beta release of version 1.5.6 of DCS World, we have made several fixes and improvements to this version. This weekend we are moving this version from Open Beta to release status. In addition to these two bundle deals, we are also offering 60% off DCS: Combined Arms with use of bonus points. Both the bundle and bonus deals will start today at 1500 GMT and last until 17 April 2017 at 0900 GMT. Over the past three weeks we have released, and will continue to release, a series of short videos that highlight units coming to the World War II Assets Pack. The DCS: World War II Assets Pack provides numerous World War II air, land and sea assets to populate the Normandy and other DCS World maps with. Eagle Dynamics has spent several years creating an entirely new set of combat vehicles to support DCS: World War II, and each unit is created with an exceptional level of detail and accuracy. In addition to populating World War II era maps, this asset pack can be used with all other DCS World map modules.